Perhaps no American president is more associated with nature and wildlife than Theodore Roosevelt, a prodigious hunter and adventurer and an ardent conservationist. We think of Roosevelt as an original, yet in The Naturalist, Darrin Lunde shows how from his earliest days Roosevelt actively modeled himself in the proud tradition of museum naturalists—the men who pioneered a key branch of American biology through their desire to collect animal specimens and develop a taxonomy of the natural world. The influence these men would have on Roosevelt would shape not just his personality but his career, informing his work as a politician and statesman and ultimately affecting generations of Americans' relationship to this country's wilderness. Pulling from Roosevelt's diaries and expedition journals, Lunde constructs a brilliantly researched, singularly insightful history that reveals the roots of Roosevelt’s enduring naturalist legacy through the group little-known men whose work and lives defined his own. Another book chosen for a strange reason. I've recently become obsessed with reruns of Blue Bloods despite the fact that I'm not a huge fan of Tom Selleck. Police Commissioner, Frank Reagan, likes to quote famous people a lot, and one of his favorites is Teddy Roosevelt. 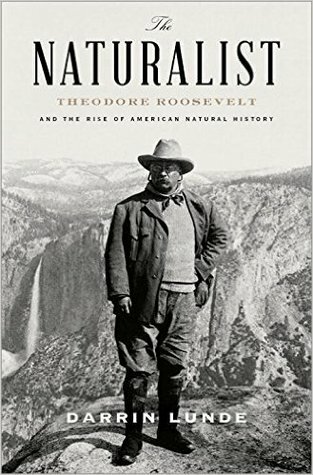 I know the interesting tidbit here and there about our 26th President but nothing substantial, so I went looking for an interesting book and stumbled upon Darrin Lundy's The Naturalist. Like David McCullough, Lunde is a storyteller, presenting information in a relatable, entertaining way. This particular books focuses specifically on Teddy Roosevelt, the naturalist - hunter, scientist, and conservationist. From his childhood gathering small mammals and birds to the big game hunter in the bush of Africa, Roosevelt believed in the importance of gathering biological specimens for study. He also believed in preserving nature for generations to come. Through interesting anecdotes of Roosevelt's own life, along with the work of professionals that inspired and mentored him, Lunde provides a snapshot of not only the man but of a time period. I was most interested in the struggle to establish the different museums of natural history, including Roosevelt's own personal museum that was curated during his childhood when he was of a sickly disposition. Because the book focuses on only one aspect of Roosevelt's life, it felt almost dismissive of his other pursuits. His presidency is only briefly mentioned and often sounded as if the politician would have rather been anywhere other than in office, spending most of his time dreaming of and planning hunting expeditions. But now I'm eager to learn more. He is such a vibrant historical character, and I still need to hunt down the moments that have given Frank Reagan so many thoughtful moments. Any suggestions on what I should read next?